BUY MY AUDIO CD - NOW AVAILABLE! 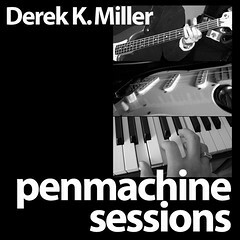 The MP3s are still free to download and share, and will stay that way. You can read about my the CD on my blog, or go ahead and buy it right now. NOTE: Most of the photos on this page are from the manufacturers of the various guitars, unless I took them myself. The Squier Double Fat Telecaster Deluxe was a tough one, and the only photo I could find was from a classified ad from the U.K. Originally posted to my journal on 9 July 2005. How do you buy yourself an inexpensive electric guitar? A guitar is a highly personal item—the particular instrument that's right for you, that fits your hands and body, and that sounds right differs from what's right for someone else. That's why there are so many thousands of different guitars out there, from so many manufacturers and countries. Each of us who plays can find the one that's right—or have it made. Here's how I found mine. UPDATE July 2006: A year after this article first appeared, I bought myself yet another guitar, a hot-rodded Yamaha Pacifica, in Seattle for $250 USD. Interestingly, after the drawn-out process outlined here, I was well enough informed to make a snap decision on that instrument almost as soon as I saw it. In the spring and early summer of 2005, I set out to find myself a new solidbody electric guitar. While I'm a professional musician, and have been since 1989, in that life I play the drums. Yet I've always been more fascinated with the guitar, the instrument I first learned on a classical acoustic at age eight, and which I took up again after a long absence in the late 1980s using friends' and bandmates' electric instruments. In 1990, I bought myself a then-new Korean-made Squier Stratocaster, which I modified somewhat to fit my style. My Strat is a fine-sounding and -playing guitar, but after 15 years I thought it time to buy something to supplement it. The kicker was, I wanted a good guitar, but for not much money—less than $500 Cdn ($350 USD), and preferably less than $300 Cdn. (All other figures here are also in Canadian dollars.) This article describes the process I went through and the guitar I chose—but while it will give you some guidance, there's a good chance that you would choose something else, which feels and sounds right to you. If I were looking for a replacement for my Strat, the most obvious option would have been the Fender American Hardtail Stratocaster (site, reviews). That's because years ago I blocked the vibrato mechanism of my Strat—used to bend the strings for pitch-bend effects—because I don't usually use it, and it tended to throw the guitar out of tune. Electric guitars without tremolo are called "hardtails" or "stop tails," and Fender makes a Stratocaster for those who prefer them that way. Still, I wanted something to go with my Strat, not to take its place. I'd always liked Fender's other classic model, the Telecaster, too. That, and the Hardtail Strat runs about three times my budget. Next! 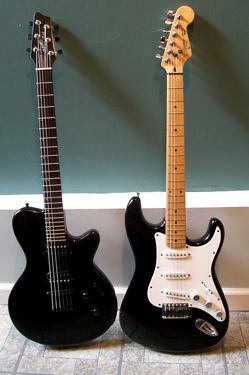 The good import guitars—particularly those sold as low-budget models by major brands such as Fender (Squier), Gibson (Epiphone), Ibanez, Hamer (Slammer), and Gretsch (Electromatic)—are favourites of guitar hot-rodders, who take the basic platform and replace pickups, bridges, electronics, and tuners to create their own custom high-performance axes from cheapie templates. And we're not even talking about the used market yet. A bolt-on neck, like Fender, not glued-in, like Gibson. A 25.5" scale length (from bridge to nut), like Fender, not 24.75", like Gibson. Preferably a one-piece maple neck with maple fretboard, again like many Fenders, rather than a rosewood fretboard, like Gibsons. At least one humbucking (dual-coil) pickup, rather than all single-coil pickups as on my Strat, since I wanted some different sounds. An attractive but practical design, with little in the way of inessential bells and whistles. Durable, reliable construction with quality parts, to last for some years. Good enough materials and components to get a good sound right away, without significant modifications. Back in December 2004, I had recommended sight-unseen that my guitarist's girlfriend buy him an Indonesian-built Squier '51 (site, reviews) for Christmas—early magazine and online reviews declared it a winning combination of retro looks (hybridizing a Strat, Tele, and a 1951 Fender Precision Bass), useful sounds, and a dynamite low price (only $200). His '51 sounded cool and played nicely when I tried it, but its black finish and white pickguard looked too much like the Strat I already owned, so in mid-June 2005 I cast about for another colour. A couple of stores in Greater Vancouver had the Squier '51 in butterscotch blonde (or "mustard yellow," if you prefer), so I drove to the Long & McQuade in North Vancouver for a try-out. I was surprisingly uninspired. The guitar felt good and looked fine, but its front (neck) single-coil pickup sounded plain, while the rear (bridge) humbucker was unusually bright and harsh. I had walked in thinking I might buy one, and left confused. Maybe it was just the one guitar I played, I thought. Down the road at Maple Leaf Music, I found a Jay Turser "JT" (site, reviews) Telecaster clone. The company makes a variety of clone-style instruments (I haven't seen much in the way of original designs from them) in China, and the JT is a good one, feeling at least as solid as Squier Teles, at a lower price (about $180–190). But it was not quite what I wanted—I don't like the classic Telecaster raised metal lip around the bridge pickup, and two single coils weren't quite what I sought either—so I moved on to the Neil Douglas Guitar Shop in New Westminster, where I tried another Turser JT and a few models from Cort and Ibanez. Still no luck. About a week later, my family and I were in Seattle for the Gnomedex tech conference. On the free afternoon of June 22, 2005, my girls brought their scooters and we made our way from our hotel to Guitar Center, by far the largest single music retail space I've ever been in. Guitar Center had two beautiful sunburst-coloured Squier '51s (plus black), as well as a strong selection of other guitars in my price and feature range. Once again, the '51s were just... okay. Humbucking pickups are usually darker and more bassy sounding than single-coils, but the humbuckers on the '51s were the opposite: bright to the point of shrillness. And the volume balance between them and the front single-coils was off. So I tried a dark wine-coloured Squier Tele Special (site, reviews). Like the '51, it had both single-coil and humbucker pickups. They sounded better, but the overall look of the guitar (plus its rosewood-on-maple fretboard) wasn't quite my style. The Squier Tele Custom (site, reviews) hanging nearby, on the other hand, was everything I wanted (others agree). It sounded great and felt right. It was heavy, but not oppressively. The chrome-covered humbuckers had the right grit in their sound, and lots of control from separate volume and tone knobs for each. The maple neck fit my hand well. Yet my girls wanted to explore the drum department, and with the Canadian dollar running high, the exchange rate for buying the Custom in the U.S. ($200 USD, or about $250–260 Cdn), instead of back home, wasn't especially favorable. If I'd been there on my own instead of with two elementary-age children dragging me out the door, or if the Custom had come in any colour but black (it does not), I might have paid the bit extra to have the Custom in my hands. But we scootered back to the hotel, buying only a couple of rubber ducks on the way. Still, I was encouraged. Back in Vancouver on July 2, 2005, I resolved to take part of my fresh paycheque, stop hemming and hawing, and get myself a damned guitar. I expected it to be a long day. My wife was encouraging—later, I discovered that was because she was trying to put together a surprise party for me that evening, and was happy to have me out of the house. After dropping my older daughter off for a visit with her grandparents in Maple Ridge, I dropped into the Long & McQuade store in Port Coquitlam, where I immediately came upon a lovely '72 Telecaster Custom reissue (site, reviews)—the inspiration for the Squier Tele Custom above, but with only one humbucking pickup, and a regular Telecaster single coil in the bridge position. It felt great, despite the '70s-style three-bolt neck joint I'm not fond of, but cost too much (about $900), so I never even plugged it in. Right next to it in a big display of various Telecasters was a semi-hollowbody '72 Tele Thinline reissue (site, reviews), in a natural wood finish with two humbuckers. Like its neighbour, it was made in Mexico, had the three-bolt neck, and felt wonderful despite that—but ran at least twice my budget. Both the Custom and Thinline took me back to the late '80s or early '90s, when my friend (and then-roommate) Alistair borrowed a (genuine '70s?) Tele Custom from his friend Spencer for a few days, before buying himself a Stratocaster. The Custom had been in the back of my mind ever since as a good guitar for me. Which brought me to the Squier Telecaster Custom II (site, reviews), identical to the guitar I'd tried and liked in Seattle, but with P-90 "soapbar" single coil pickups instead of humbuckers. It sounded spectacular—the P-90s (best known from Gibson guitars used by players such as Pete Townshend of the Who and Billie Joe Armstrong of Green Day) have wonderful growl and heft. The shop had another Squier '51, which, when I tried it, sounded thin and weak by comparison. But this particular Tele Custom II suffered a number of quality problems—knobs that made scratchy sounds when I turned them, and a loose connector jack. Had the store had another in better condition, I would have bought it. But to have to repair a brand new instrument, even one costing only $265, made no sense, and nothing else at the PoCo L&M fit the bill. Down Lougheed Highway is an outlet of Vancouver's other major instrument sales chain, Tom Lee Music. Their selection consisted mostly of fairly expensive guitars, plus a huge rack of Chinese-made "Music Research Works" (MRW) guitars (site), which seem to be a private label for Tom Lee. Most were nothing special, clone guitars in the vein of the Jay Tursers, but with less personality. But one in particular was fairly nice, unusually shaped, less than $200, and (to top it off) bright yellow. I liked it well enough. Over the day, though, I'd decided I was unlikely to buy a guitar made in China, largely because, while I buy lots of things from that country (like my iPod), for a significant purchase like this one, I thought I should try to choose an instrument built somewhere other than the world's cheap-stuff manufacturing behemoth. Still, I thought I'd try a few more guitars in the store. Gretsch's Electromatic Junior Jet II (site, reviews) was an option. It was pretty, and I knew that Sebastien, the guitarist in my band, had switched to a higher-end hollowbody Gretsch Electromatic from his own Squier '51 for most of our shows. This Junior II had a retro appeal, but felt awkward in my hands—too plank-like, with the neck too thin, the body to rear-heavy. It was time to drive again, this time all the way across Vancouver's eastern suburbs, through downtown, and to the Granville and Broadway neighbourhood that's home to my old haunt from the early '90s, Not Just Another Music Shop (NJAMS). They carry mostly vintage and other used instruments, as well as high-end California hand-built guitars and basses ($1400 and up) from G&L, the last company to employ guitar pioneer Leo Fender before he died in 1990. G&L also has a Tribute line of guitars, which is among the best values out there, but still runs twice my budget ($700 and up) despite being assembled in South Korea. So I had to pass by the beautiful Tribute ASAT Special (site, reviews)—Leo Fender's last take on the Telecaster he invented at the beginning of the 1950s. 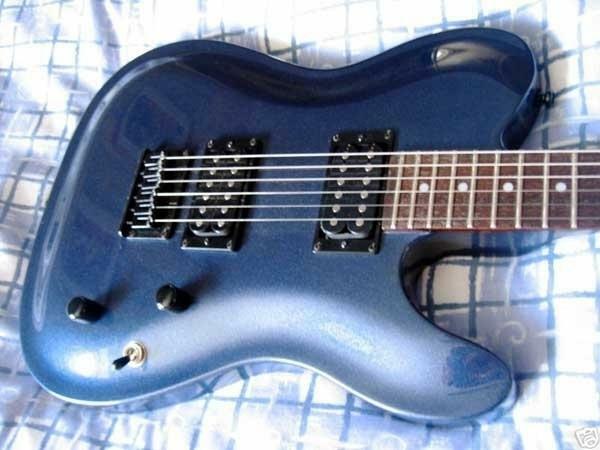 The only other guitar at NJAMS that worked for me was a Hamer Slammer Special SP1 (site, reviews) ($250 used), which, like many other low-end instruments, was built in Indonesia, but is a quality guitar nevertheless. The red finish was beautiful, and I seriously considered it—but I wanted to see what the main Vancouver outlet of Long & McQuade, only a block away, had to offer. That turned out to be quite a lot, including my final choice. Ibanez is an interesting company, a Japanese brand that started out building cheap import guitars decades ago, using a fake Spanish name, and now one of the world's best-respected electric guitar builders. 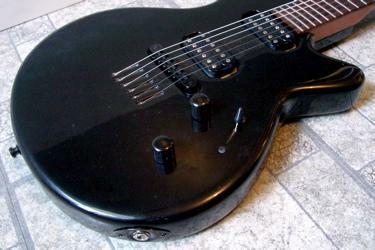 The Ibanez GAX30 (site, reviews) (again, about $200) follows the modern trend, and is built in China. While similar to the Hamer Slammer, I liked its beveled edges, deeper red colour, small pickguard, angled controls, and short cutaway horns even better—but I still didn't feel right about buying from China. L&M also had a wide selection of guitars from Epiphone, which, like Fender's Squier division, imports "authorized" knock-offs of famous models like the SG, Les Paul, and so on. Yet the Epiphone Special (site, reviews) models (both single- and double-pickup versions, starting as low as $180) are also Chinese-made, and nothing special for it—the Ibanez, Slammer, and Squier guitars have much more intangible vibe and feel. Or maybe that's just me, because I'm not a Gibson guitar fan. I couldn't resist trying out a few more Telecasters, including Mexican models ($600–$800) and even the higher-end U.S. built guitars ($1000+), which of course I couldn't afford. On the other hand, while a standard Tele in other respects, the Squier Black and Chrome (site, reviews) model looks great, feels solid, and sounds good. It seems that Squier put a bit of extra care into it over their other releases. While browsing the used-guitar rack, I came across one I'd never seen or heard of: the Korean-built Squier Double Fat Telecaster Deluxe (reviews), which must be a few years old. This was a pewter-coloured guitar that looked different because of its carved top, and sat well on my lap. But I didn't like the fretboard—it had an old-style deep curve (what guitarists call a small fretboard radius, of 7.5 inches) that felt wrong in my hands. This was not what I was expecting. It had a short Gibson-scale (24.75") neck (not my preference), made of mahogany (not my preference), with a rosewood fretboard (not my preference), and it was black (which, because I already have a black Strat, was not my preference). At least it had a bolt-on neck. And yet it felt just perfect in my hands. I plugged it in, and it sounded good too, through several different amplifiers and an amp simulator. Plus, it's assembled in the U.S.A. from components made in Canada (how about that—the U.S.A. as a place to put a low-cost assembly facility). Godin is a Canadian company, based in Quebec, known for making quality, somewhat unusual acoustic and electric guitars, under a variety of its own brand names, at reasonable prices—in this case, only $350. I later discovered that the black LG was an older model, made before 2004, when Godin changed the design somewhat. Since L&M is one of Godin's major Canadian dealers, they also had a selection of the newer model, which has a more refined neck joint, different pickups, and more sophisticated switching, for $500 brand new. One was even a used prototype of the newer model, for $400. But you know what? While the red new models were much prettier, and had some nice-to-have features, the old black one sounded better and cost less. So I bought it. The black Godin LG was the kind of guitar that everyone always advises you to buy: it spoke to me after trying a whole bunch of different instruments. The LG has a wonderful acoustic chime when not plugged in—despite all the mahogany, it is not heavy (lighter than my Strat, oddly enough) and it's well balanced physically and tonally. So far I've played the LG through a Traynor Custom Valve combo and Line 6 Pod (in the store), then at home straight into my '70s silverface Fender Princeton 12-watt combo, then through a SansAmp GT2 amp simulator and the Princeton, with and without a Danelectro Daddy-O overdrive and an MXR Phase 90 phaser pedal, and straight into my eMac with the built-in guitar effects in GarageBand. I have yet to get a bad sound out of the LG: from chiming clean to R&B crunch to Cali-metal over-the-topness, it handles them all well. The two pickups are exposed, without the chrome covers on the newer LGHB model, but like the Duncan P-90s on its sister LGP90. Oddly, my guitar also lacks pickup rings, which every other LG I've seen has—yet there are no screw holes indicating that it even came with them. 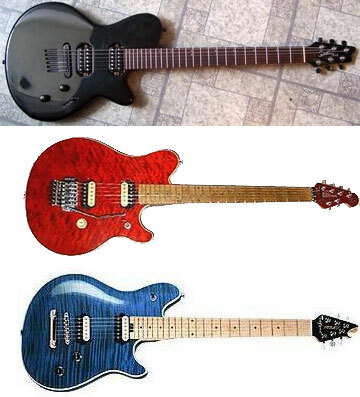 Also unlike the newer model, mine has a 3-way (not 5-way) pickup switch and a longer 24 (not 22) fret fingerboard. The pickups balance well, sound good, and are labeled Godin, although they may be modified Seymour Duncans, since Duncan makes pickups for many other Godin guitars, including the otherwise identical LG P-90 model. The humbuckers are also great pickups for this price of guitar, with lots of articulation and a variety of good sounds from clean to overdriven. They're not especially high-output ("hot") compared to other humbuckers or, especially, P-90s, but they certainly have enough oomph for my needs. As they should, the humbuckers block most electrical buzz, which is nice compared to my old Strat. Because of the humbuckers, I had to adjust the tone controls on my amps and effects, since they were set for the much brighter, bell-like pickups on my Strat, but that would be true for nearly any humbucker-equipped guitar. The change was particularly noticeable in GarageBand, but I was able to get great tones with a bit of tweaking (check out "Clouds or Smoke? ", an instrumental I recorded using only the LG and some drum loops). And it was also what I wanted. My Strat, though cheap, sounds good, and I wanted something different, not a replacement. The LG is it. The body shape is distinctive—as I mentioned, Godin has its own way of shaping guitars—with a single small lower cutaway, yet not like a Les Paul or a Telecaster. The body is flat on the front and sides, like a Tele, and contoured on the back, like a Strat, with no pickguard, like some Les Pauls. It uses what is apparently a Graph-Tech white nut, fairly large frets, and very smooth Godin black-buttoned sealed tuning machines on a small headstock, which is designed not to need string guides for proper string alignment. The black finish is slightly sparkly ("black pearl"), rather like the Toyota Echo we bought last year, and unlike the pure glossy black of my Stratocaster. The bridge is a non-vibrato Tune-o-Matic hardtail style, like I was looking for, made by Schaller, with convenient flat-head adjustment screws, in front of an attractive staggered string-through-body tailpiece that ends on the underside of the guitar, not with individual holes for each string, but in a single brass end plate which looks very solid. The bridge, knobs, and pickups are all black, giving the guitar a bit of a stealth appearance, which fits with its character—it surprised me by how much I liked it. The in-set design of the bridge and pickups mean that the strings can lie low to the guitar's body right from the fretboard to the tailpiece. The action is good, without buzz. The LGs come stock with .010" through .046" strings, which is nice because I prefer heavier gauges—but I changed them anyway, setting the guitar up for even heavier .011 to .052s instead. The fretboard is reasonably wide and very, very flat. Godin has developed a particular, and peculiar, fretboard design that uses a 16" radius (rather than the very curvy 7.5" of old Fenders and the Fat Tele Deluxe I looked at, 9.5" of many newer Fender guitars, or 12" of a lot of modern instruments) with nicely rolled edges. Yet even as someone who prefers Fender-style necks, this one felt very good and was not hard to play barre chords on, despite the lack of curvature. The neck itself is pretty beefy, but not too big, and both it and the fretboard are fairly grainy-feeling, rather than having a slick finish. I like that. 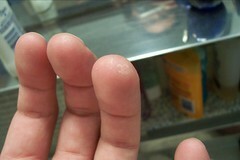 There are a few minor dings and scratches here and there on my guitar, but nothing significant. Just evidence that it's been played. There was a still a sheet of plastic shipping film over the control plate cover on the back of the guitar, which indicates mine isn't too old. All the hardware feels exceptionally solid, and none of the controls is scratchy. Tuning stability is good. When I looked at some of the other import guitars, I had planned on having to replace the bridge saddles, nut, and string trees with higher quality components (as I had on my Strat years ago), but the LG has good material, and I don't think such changes will be necessary. I noticed a bit of paint wear inside the holes where the strings enter the body at the top, but I guess that's expected, and it doesn't detract from performance at all. The guitar was a bit dusty, either because its owner hadn't played it for awhile, or because it sat on the wall at the store for a few months. A damp cloth took care of that. Overall, the construction of the Godin LG is miles ahead of any of the Asian-built instruments in this price range, and at least as good as, say, a Korean G&L Tribute or Japanese or Mexican Fender at twice the price. Sure, the exposed pickups look a little bare, and the guitar is minimalist. It doesn't have the cachet of a Strat, Tele, Les Paul, or Gibson SG. Whatever. It took a long time and enough guitar playing to give me fresh calluses on my fingers, but I'm glad I made the effort to find the LG. It is a quality, functional instrument, not a museum piece. It's meant to be played. That's just what I plan to do. May as well put those calluses to use. P.S. You can hear what the LG sounds like in "Clouds or Smoke?" a track I recorded in GarageBand with only the Godin and some drum loops. © 2005 Derek K. Miller. Some rights reserved. You may use content from this site non-commercially if you give me credit, under the terms of my Creative Commons license.